For well over three years we have recognized the stark difference in principles, politics and methods of functioning between our independent organization Black Lives Matter: Cincinnati (BLMC) and the national leadership of Black Lives Matter (BLM), the Movement for Black Lives network (M4BL), and other spin offs and creations of this sliver of the Black liberation movement. BLMC has never been a chapter of that organization or a partisan of its politics because, even at the onset of us establishing our name as BLMC, we recognized that our idea of the type of movement necessary to win black liberation was at odds with that national body and it’s directives. We originally took the name, inspired by a rising movement for Black liberation, manifested through spontaneous actions breaking out after the killings of Mike Brown, Jr., and Trayvon Martin. People chanted “Hands Up, Don’t Shoot!” and “Black Lives Matter.” This was before any serious national structure and unified platform existed. We felt — in that context — we had the right to try to champion the name and give it the meaning worthy of the people it claims to support and defend. Internally, we have agreed for some time that it is our duty to represent a different pole of attraction to the strategy and perspectives of BLM in Cincinnati and nationally. We debated, however, how and when to formally break with the name. Because WE (BLMC) have done real work under that name and did not want to surrender it to those we feel cannot and have no interest in building a revolutionary movement for Black liberation. But we can no longer use or identify with the name Black Lives Matter — a rally cry that still has meaning, even if perverted by those pushing it as a brand. The depth and scope of betrayal of struggles against police brutality and the families fighting for their loved ones is too great. The continuous shift towards electoral and liberal Democratic Party politics and away from revolutionary ideas is too great. The consequences for Black, brown, and poor people are too great. The possibilities to build a truly independent movement on a national scale for Black liberation are too ripe. BLM did not create or build this new grassroots movement against police brutality and racism; they capitalized off a nameless groundswell of resistance sweeping the nation, branded it as their own, and profited from the deaths of Black men and women around the country without seriously engaging, as a national formation, in getting justice for fighting families. All the while raking in hundreds of thousands of dollars from high-end speaking engagements and donations from foundations that support the Black struggle (or want to co-opt it). They have gained access to high profile associations, including invitations to the White House and celebrity events; have been on magazine covers; are on the way to profiting as authors and subjects of books; and have accepted numerous awards and accolades as so-called founders of the movement — while families struggle, unassisted, to keep their fights going. So many people on the ground have shared a similar experience: when the reporters leave and the bright lights are gone, so are they (BLM). There are a couple of individual groupings using the BLM name that are on a trajectory similar to ours and have carried out principled work. They are exceptions to an overall course charted by BLM national. BLMC travelled to St. Louis and met numerous families and community fighters still pushing to get killer cops indicted, arrested and jailed. They have all told us the same story: people on the ground were mobilizing and making gains in the fight. They were mobilizing people in militant action against city and town administrations and the police. Then people from the organization now known as BLM, DeRay McKesson, Color of Change, Dream Defenders, and others descended upon St. Louis. They took media credit, pushed the BLM name and as a result, concessionary funds from the government as well as from those with money looking to make contributions for the fight all funneled into the coffers of BLM and local activists willing to cut deals against the interests and wishes of the people of St. Louis most affected by police murder. No chapter of BLM existed in Ferguson. But the media carried and carries the lie that this broad collection of families and fighters exist under a BLM umbrella. They don’t. BLM is a small fraction in a larger pie of the Black liberation movement, nationally. There are many organizations and individuals doing work with no affiliation to BLM and with many different names. All the powerful sacrifices of autonomous families and groupings around the country are continuously attributed to works of BLM. Grassroots leaders of the struggle in St. Louis, including Darren Seals, have been assassinated by what many believe to be police forces. Multiple people have been shot in the head and burned in their cars with high-grade accelerants over the past 3 years and BLM has not uttered a peep in their defense or called for a special investigation. Several of these slain activists spoke out about the treachery of BLM and McKesson and some of the deals being cut behind closed doors. Before the trip to St. Louis, in the summer and fall of 2015, BLMC attempted to work with the Rice family (from a distance) to build momentum for the fight to jail the cops that killed Tamir Rice. Samaria Rice’s sheer will to get justice inspired tens of thousands across the country. Grass roots formations across the Midwest and South began to respond to these efforts, led by Samaria Rice. BLMC raised hundreds of dollars to rent busses, local unions were contributing and making plans to attend what was shaping up as a regional protest, steadily building into a national one. Several churches in the South were beginning to get busses and organize their congregations to attend. Chicago and Boston activists were mobilizing support as well. The family — rightfully so — reached out to BLM national for additional help. What happened next was treacherous. First, the open phone conferences organized to plan the #YearWithoutTamir action were shut down. BLM national, through a local leader they assigned, set up a new conference call where no one could speak but the moderator. They alienated churches who planned on sending support from the South. They refused to declare a firm day for a mass action, despite repeated requests from BLMC and numerous other groups. This made it impossible for unions and other organizations to zero in on a key day to bus people in. That single action destroyed union, regional and national support. At the last minute, a protest action day was called, but by then it was too late. The result was that only a couple hundred people — mostly from the nearby region — attended the action, when the stage (through the work of the Rice family) was set for many thousands more on a scale we saw later during the Philando Castile actions. The BLM leaders of that debacle then blamed local Black residents for low attendance at an event that was not built in any serious way and not geared towards mass participation. Months before this event in July 2015, BLM held a half-week long “Movement for Black Lives Convening” conference in Cleveland. The conference — which was advertised as a gathering against police brutality and racism — centered Black trans rights issues almost exclusively and buried families fighting police brutality into obscurity. This was done without consulting any participants, including invited families whose loved ones were killed by cops. This was a huge blow to the struggle for Black trans rights, because it fit perfectly into the false, transphobic narrative that that marginalized grouping has “an agenda” at odds with Black liberation for all. While BLM is an organization that centers Black queer and trans rights, it DOES NOT represent queer and trans Black people as a whole. Families, who were very gracious under those conditions, were pushed so far out of the conference politically that even their workshops (which were informative and powerful) were sideline issues and a tiny percentage of workshops on the whole. It would have been very easy to weave the important questions of gender sovereignty into the event in an organic and meaningful way. It was a moment that could have educated layers of people new to that struggle. Instead, it caused a veneer of resentment. There have been similar stories of betrayal told by families and activists involved in fights from California to Boston and from to Minneapolis and Baltimore. Furthermore, in every police brutality case we’ve witnessed, BLM refuses to call for the jailing of killer cops. This is a universal demand of families whose loved ones have been killed by police. After having shed the husk of anti–police brutality action, BLM has been on a gradual course to gear its activities towards electoral politics and reformist campaigns. The heart of the M4BL platform (incidentally not informed by a single chapter of it’s organization, but instead drafted by non-profit organizations) is to focus on pushing for various legislation. Little is said about action and protest. The power is removed from the people and placed onto the ballot. This suits some “activists” just fine. Not our organization in Cincinnati. Most recently they have launched the so-called “Electoral Justice Project” which uses radical sounding jargon to convince Black people and their “white allies” to put their energies into focusing on policy change. The reality will prove this initiative to be nothing more than a Black pressure group aimed at nudging the Democratic Party; the tired and failed strategy that has led social movements to their graves. They seized on the debuts of “A Wrinkle in Time” and Marvel’s “Black Panther” to register people to vote. This is their focus as families in cities across the country are beginning to demand retrials, as actual acts of racism continue and as a known white supremacist toured the country, spurring mass actions in several cities. The Electoral Justice Project webpage states “The Movement for Black Lives is launching the Electoral Justice League, an intensive cohort and coaching process that will resource 12 Black organizers for the 2018-2019 election cycle to gain progressive candidate and advocacy wins in their communities.” They will pay 12 organizers to campaign with local Democrats that say something Black friendly, but put no full-time resources into getting justice for families or using those funds to help pay for court fees, or trauma relief, or to push forward the growing organization of mothers fighting cop brutality. One only has to step back and look at their track record to recognize that they are quite literally part of the problem we face to truly get free. 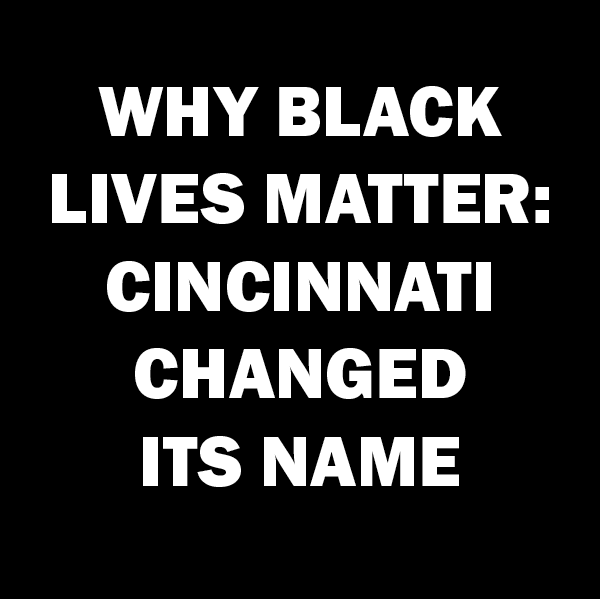 For this and other reasons too numerous to put in one document, we leave behind the name Black Lives Matter: Cincinnati. We are now Mass Action for Black Liberation. Our websites and facebook pages for a time will still be up to help point you to our new ones, currently under construction. We debated, however, how and when to formally break with the name. Because WE (BLMC) have done real work under that name and did not want to surrender it to those we feel cannot and have no interest in building a revolutionary movement for Black liberation.